1. San Francisco Session II is going like hotcakes (mmm, hotcakes) so if you still want in, get on it. 2. Speaking of San Francisco, potential camper Megan B. can only attend SF I due to scheduling conflicts, so if anyone is wiling to trade with her and go to SF II, email me here. 3. I have to be honest with y'all, I am a little concerned about Austin. Some cities are just more popular than others, and I cannot explain why. But Austin is coming up fast, and I do not have enough attendees, despite an enthusiastic verbal showing! So if you were thinking about coming or are on the fence or whatever, you need to sign up in the next few days. Come on, Texas, represent! As a former Texan, I will take it personally. And you know you want to spend a weekend having delicious cocktails in the San Jose courtyard (where I'll be staying every second I'm not telling y'all how to dewit). Go. 4. Who wants to have Camp in Chicago? I do. But I am only adding it if Oprah promises to attend. 5. Just kidding. Here you go, Chicago. I hear you're lovely in December. In closing, please enjoy this photo of the current state of my bathroom. 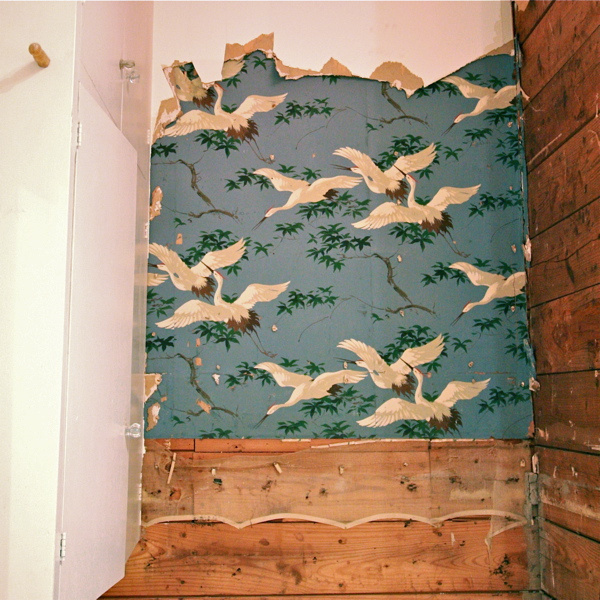 I am actually kind of in love with that wallpaper -- which I am pretty sure is hand-painted-- I discovered under the drywall. Don't worry, I saved a big old piece.